The solution to this situation is an enhancement to the basic subnet addressing scheme called Variable Length Subnet Masking (VLSM). 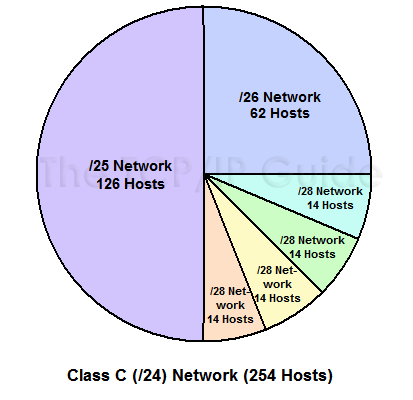 VLSM seems complicated at first, but is easy to comprehend if you understand basic subnetting. The idea is that you subnet the network, and then subnet the subnets just the way you originally subnetted the network. In fact, you can do this multiple times, creating subnets of subnets of subnets, as many times as you need (subject to how many bits you have in the host ID of your address block). It is possible to choose to apply this multiple-level splitting to only some of the subnets, allowing you to selectively cut the "IP address pie" so that some of the slices are bigger than others. This means that our example company could create six subnets to match the needs of its networks, as shown in Figure 71. Using VLSM, an organization can divide its IP network multiple times, to create subnets that much better match the size requirements of its physical networks. Contrast to Figure 70. Key Concept: Variable Length Subnet Masking (VLSM) is a technique where subnetting is performed multiple times in iteration, to allow a network to be divided into a hierarchy of subnetworks that vary in size. This allows an organization to much better match the size of its subnets to the requirements of its networks.